Confession time: I have a love/hate relationship with meringue. I love Lemon Meringue Pie, with its tart curd base and fluffy marshmallowy meringue piled high on top, the epitome (in my eyes) of foodie poetry. I hate polystyrene meringue shells, packed in pink boxes in supermarkets that turn to a pile of dust with one bite. Although I always save my egg whites for some use-em-up dessert (I made a lot of yolk based dishes this week) the idea to put macarons into practice again following a visit to Aberdeen patisserie gods Almondine went out the window. My lack of sugar thermometer and a downright refusal to try the French method again (bubbly, funny looking results) had me swerving towards a meringue recipe that would not crumble under pressure. To the rescue came Sweet Tooth, the baking bible by lovely lady Lily Vanilli (who I interviewed for my dissertation no less) and these cocoa meringues caught my eye. With a charity bake sale cooing my name from work (a bakers job is never done), I rolled up my sleeves and tackled my meringue demons. The resulting chewy, chocolaty, toasted nutty goodness confirmed meringues are back on the menu. Feedback ranged from “They look good”, “They taste amazing” and my personal favourite “I always thought meringues were an unfinished thing you had ‘with something’. 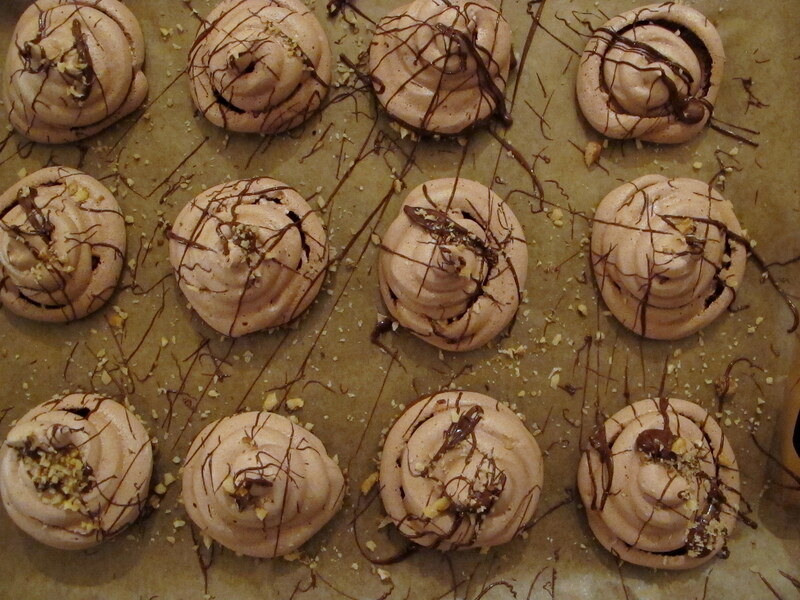 But this cocoa meringue went perfectly just with a cup of tea”. High praise indeed from the workies. Points to consider before tackling these meringues. Save up your egg whites. Cracking fresh will leave you with a lot of yolks and whites keep far better in the fridge. You can freeze them but I’d advise to keep covered in the fridge for up to five days, adding each white every time you need a yolk. Piping bags aren’t a necessity, a sandwich bag with the end snipped off will do just fine, or a speedier idea is simply to dollop with a spoon. Finally switch it up, these meringues would look gorgeous with a bright pistachio, or left plain white with a white chocolate drizzle and freeze dried raspberries. The world is your chewy meringue. Preheat an oven to 140oc/120oc fan/Gas mark 1 and line two baking sheets with baking parchment. In the bowl of a stand mixer, add the egg whites, lemon juice and salt and begin to whisk on high. When the mix becomes frothy and soft peaks appear, add the sugar slowly, two tablespoons at a time. Continue until stiff peaks are formed – the whisk should hold a point of meringue when turned upside down. Fold in the sifted cocoa powder with a spatula in a figure of eight motion, careful to not knock any air out. Divide the mix between 2-3 plastic piping bags, snip off the end and pipe swirls of meringue until you have around 25-30 shapes. Place the baking trays in the oven and bake for an hour or until set. Then switch off the oven and allow the meringues to dry inside for a further hour. When cool, toast the walnuts in a small saucepan for around 5 minutes over a medium heat. Finely chop and set aside. Over a pan of simmering water, melt the chocolate in a bain marie, taking care to not let the bowl touch the water. To decorate, either dip the bottom of each meringue in chocolate and nuts, or flick the chocolate across the meringues and sprinkle over the toasted walnuts. Leave to set then serve. I have to admit to having a weird soft spot for shop bought meringue – my Granny always used to give them to us when we were little – but do agree that homemade is best! 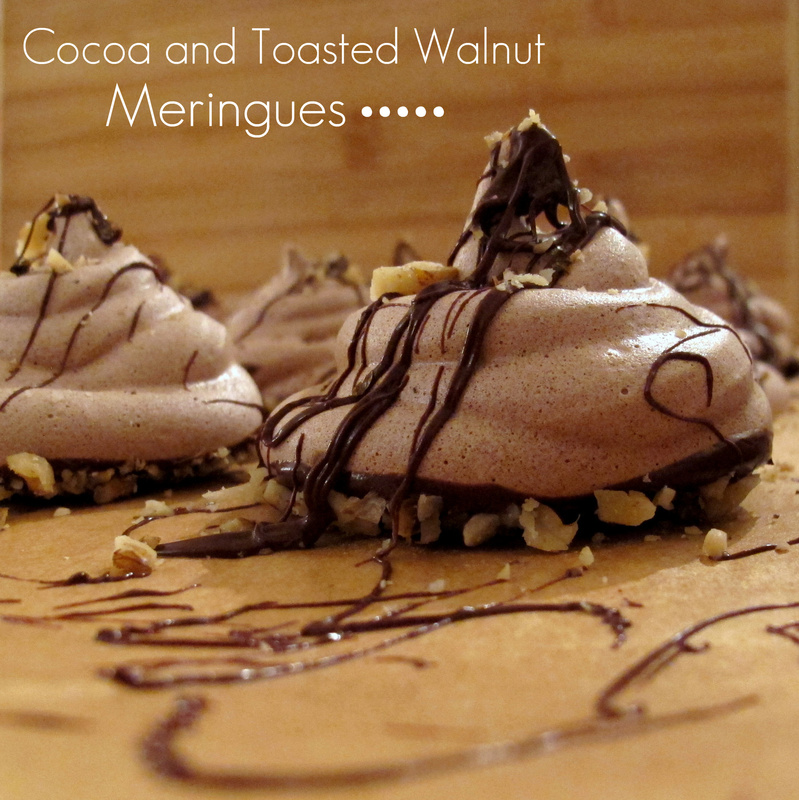 These look delicious – I love chocolaty meringues. Are the other recipes in Sweet Tooth good? I might have to buy it! Id say its worth it, a lot of background knowledge is in it too, you could almost kid on your learning about cake-history! I’ve another recipe coming up from there and for £8 on Amazon you can’t go wrong!